The more features set-top boxes and entertainment systems get, the more buttons you need on your remote control. Touch gestures are much more intuitive than remotes crammed with functions and buttons, but you don't want to sit that close to your TV - and you don't want greasy fingers all over the screen. Previous attempts to add gestures to remote controls, like the Logitech Air mouse and Linksys's abortive 'ring' controller used accelerometers that proved expensive or unreliable. 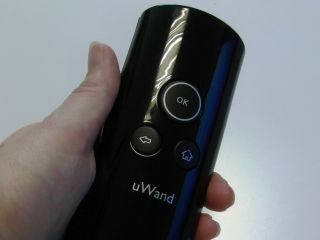 The uWand prototype that Philips has developed is much simpler; it's the size of a normal remote control but has only three buttons; OK, Back and Home (leaving plenty of room for the embedded infrared camera and RF transmitter, plus two AA batteries that will drive the uWand for a promised six months). It only needs three buttons because you use it to drive an on-screen cursor, as you would with a mouse. Unlike a mouse, though, the cursor goes where you're pointing. You don't have to find the cursor and work out how to drag it around - you just point the uWand at what you want to select on screen and the cursor appears there. That also means the cursor doesn't jump around when you put the remote down.